Those seeds must have been a thrilling find. I am also going to plant out new seeds when I get home in a week. I also have nice organic fruits and veggies now-passion fruit, pumpkins and plantains. My banana plants haven't given me fruit yet but hopefully they will in the new year. Nice to see your post after a long time. I am also thinking of ordering seeds from your source. Thanks for the info. Nicole - Thanks for the comment dear Nicole. It means so much to find a blogger friend reading your post even though the post came after a pretty long time. Lotusleaf - Thanks Padma. It is always a thrill to have you comment on my post. I am so thrilled to see these many seeds :) I sowed some flowers and herbs and they didn't germinate...i am so frustrated as it doesn't seems to be something wrong in soil PH as the dill, coriander and spinach germinated well. Waiting to get some seedlings. It's always nice to see your garden updates. Congrats on all your little seedlings! Exciting...especially that broccoli. It tastes so fresh compared to store bought...I like to grow it, but it takes space to grow enough...oh.. and do successive plantings of it as well, so you can have a stalk ready as often as you need throughout the whole season. Your daughter will enjoy that so much! I got one plant (already started) of Gretel Eggplant, and it was fun to see your plant there with clusters of them hanging down...mine is supposed to be like that, except mine are white. I can hardly wait to see them. It has a first flower right now!!! Have a lot of fun with your new babies!!! Sangeeta - Hi Sangeeta, welcome to Indiagarden. I hope you get your seedlings pretty soon; sometimes there is nothing wrong with anything, it is just the lady luck. Hey Green Thumb, I have become a collector of seeds and they have filled up half of my crisper drawer in the fridge. I ordered some multicoloured carrots and some multicoloured swiss chard. I am reaping the swiss chard. The carrots are small but it is time to harvest them. Mangoes are now ready to eat my second crop for the year. It is a great feeling harvesting ones own. love this ! these days I am watching SE Asian cuisine shows on TV and the thought of putting fresh turmeric and pandan leaves excites me. My seedlings though do not germinate beautifully - do you need to prepare a special soil ? islandgal246 - Dear Helen, wow! what a wonderful time you are having and, oh yes, nothing beats harvesting your own crop. Varsha - Dear Varsha, thanks for the visit. Well, the soil should not be clayey, it should be loose; preferably mixed with compost and some sand...hopefully, that should do the magic. Nice read and good to get connected to Indian gardening blogs... 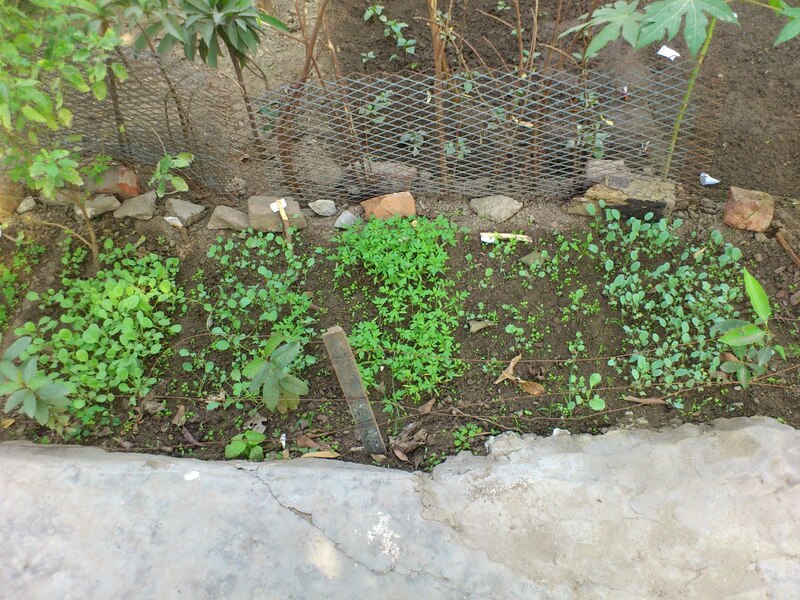 I also have a small patch and try to grow my veggies on my terrace in pots.. 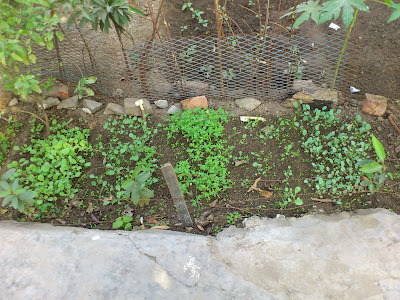 This is really a great post on seeding I think all people who are interested in gardening and plantation,they will definitely learn a lot from your post.I also love to grow different types of flowers and vegetable plants at my garden.Thanks for sharing with us. Is the seed company based in India? I would like to use that facility. I liked this content/ article. I would certainly recommend the same to others as well.visit:mumbaiflowerplaza dot com(send gifts and flowers to Mumbai). Your lemon, karela and brinjals look so beautiful. What are those green salads? Very nice blog. Your garden is a place where you would definitely like to grow something wonderful. After all, it is your realm, your lair. You deserve to grow anything you feel like without feeling guilty or hesitant. Fruits, vegetables, flowers, anything you feel like deserves to thrive in your garden. I love your vegetable garden. It was indeed a very practical idea to have one. Great job! Wow what a beautiful post i am so impressed here could you more share here i will be back to you as soon as possible. It will be good to follow-up germination FEB-MAR or even April 2012, please put new post with photos. You have quite a lot growing out there! It's amazing! To imagine ALL OF THIS that you have put together in Saharanpur... AWESOME! You have a beautiful garden! I wish had the same amount of space as you do. I found your blog while trying to find names of plants that I have in my garden. Please have a look and help out with the names if you can! Id love to get in touch with you for an article im working on. Can you give me your email Id pls? I would send you broccoli seeds if you need them and your post is reliable. I would. Let me know. Being in a garden is therapeutic.And i can imagine the joys and purity one would be subject to, if he stands in yours. 90% germination is a good figure. I think i might give this website a try. Wow lovely plants and seeds, you have very well managed the garden and the pots you have selected are really unique. Good posts and useful as well.I like this post as I came to Know that the blogger has insight experience of gardening. So, I felt like commenting. buy biocarve flowers and vegetable seeds online at agricati.in. I Buy Seeds Online India From Kraft Seeds for grow BASIL THAI HERB (SIAM QUEEN) from seed. Kraft Seeds have lot of variety of herb seeds Winter Vegetable Seeds, Summer Vegetable Seeds and Flower Seeds. if you want Good quality Herb Seeds Online Seeds visit BenarySmile. Plant the Tress and Save the Earth....So we need environmental services and pollution control management for protect and keep clean the environment. Good info, many thank you to the author. It is interesting and helpful. Good luck with it!!! It's a bliss to see such a wonderful collection of plants in your backyard..
a friendly note- If you are struggling to get seeds you can also search for them on Flipkart these days! Thanks for sharing useful information. Can u suggest me from where I can get Buy Seeds Online. nice post, thanks for share such Exotic Plnats informative blogs. Neurosis has been able to the majority of us at this point. It has been an extreme winter for the majority of the nation and seed inventories have never been more welcome! I hit your site quite by accident. My guts tell me it's going to be a fruitful accident (pun intended). Though a senior citizen I am now a budding and enthuzed gardening hobbyist. It is not that I havn't indulged in growing flowers earlier but that work was done by others (gardeners for exand I was simply and admirer of the flowers that bloomed. Also my mum was a green thumb but with limited understanding of the gardening .process and procedures. Any way very little information was available in public domain and the glossy 'Garden and Home' was exorbitantly priced. I did some thing on the keyboard and the above in-complete comment got posted. We are dealing with Professional gardening equipment, gardening tips, best Garden tools , equipment Online and watering tools with high quality. We provide door delivery to your home.